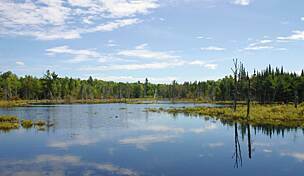 The Four Seasons Adventure Trail skirts several scenic lakes as it passes through forests and farmland, linking Newport, Corinna, Dexter, and Dover-Foxcroft in central Maine. 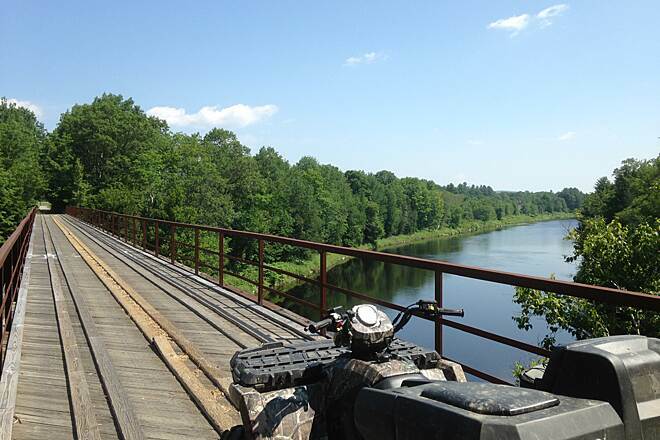 The trail experiences frequent ATV use on summer weekends, mountain bikers and horseback riders share the trail in warmer months, and snowmobilers and cross-country skiers appear when the snow flies. Snowshoeing and dogsledding are also permitted. 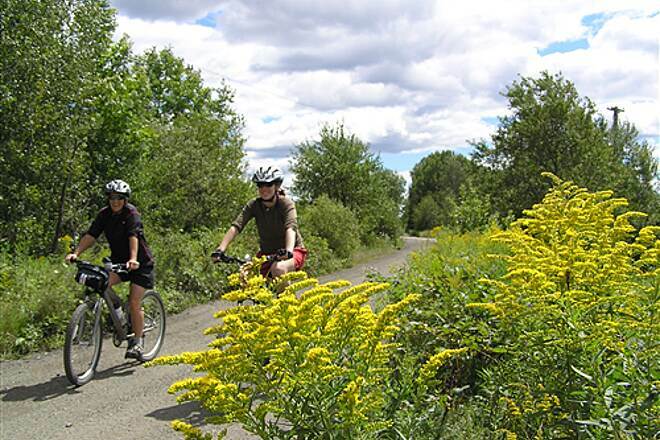 Both ends of the trail tie into the 1,000-mile-plus-long Maine Interconnected Trail System. 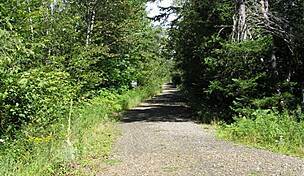 The trail follows the old railbed of the Dexter and Newport Railroad, which blazed north in 1868. The Maine Central Railroad leased the line and then extended it northward to Foxcroft in 1889. A transporter of wood products, the railway became known as the Foxcroft Branch. 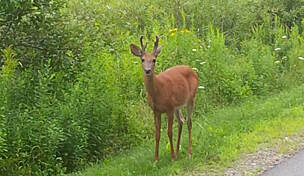 Maine Central ceased operations on the branch in 1993, setting the stage for the state’s purchase of the corridor for recreational use. 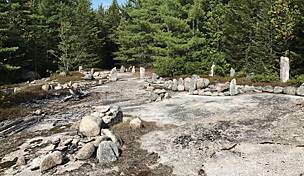 It has been known variously as the Moosehead Trail and the Newport/Dover-Foxcroft Trail before adoption of the Four Seasons Adventure Trail name. 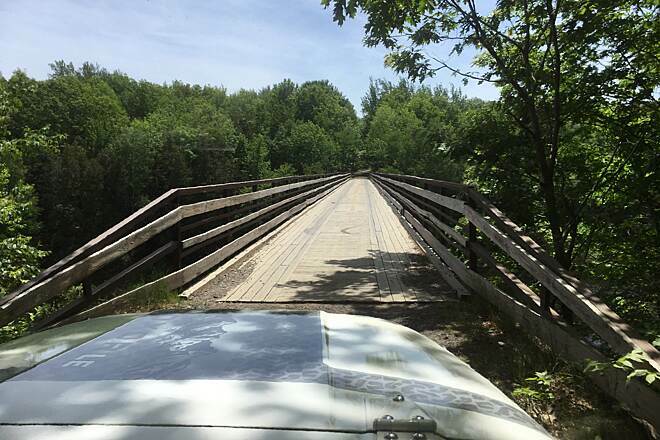 Starting in Newport, the trail passes through a business district and then some woods before it crosses State Route 7 for the second time and plays peekaboo with the 4,000-acre Sebasticook Lake. 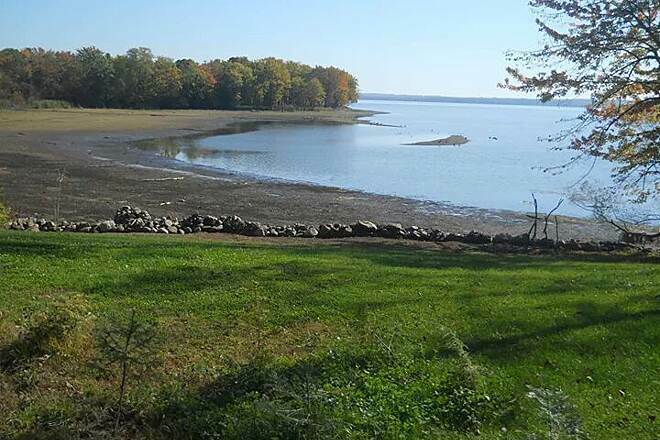 Although this area may seem remote, wooden stakes used in prehistoric fish traps discovered at the north end of the lake in the 1990s show that people lived here some 3,000 years ago. Today the lake is stocked with largemouth bass and crappie. 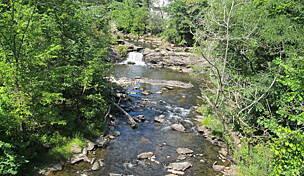 Leaving the lake, the trail wends north another 2.5 miles to the old mill town of Corinna, where an antiques shop, general store, and café offer distractions. The imposing brick building with a clock tower and belfry, a couple of blocks away, is the Free Library, built in 1898 and easily the most eye-catching landmark. 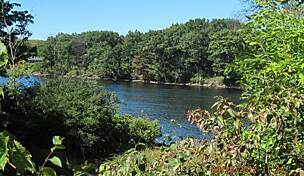 The trail offers a glimpse of a reservoir on the Sebasticook River as it leaves town, and then plunges into woods for about 7 miles to Dexter. (When you cross Line Road at 5.6 miles past Corinna, you’re crossing the 45th Parallel, halfway between the Equator and North Pole.) This old mill town, former home of the shoe manufacturer of the same name, offers cafés, groceries, and shady parks for resting. It’s easy to wander a couple of blocks east of the trail on Center Street to Water Street, where you’ll find the historical society museum housed in an old gristmill with a period home and schoolhouse nearby. 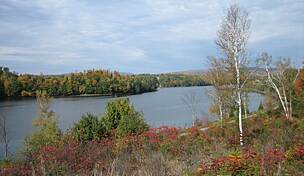 The trail rolls out of town behind some businesses and Lake Wassookeag (which means “shining water”), where you’ll see boaters and swimmers in the summer and people fishing through the ice in the winter. Leaving the lakeside, the trail meanders north for 11 miles through woods interrupted infrequently by farm lots on its way to Dover-Foxcroft. 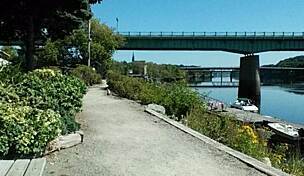 After crossing the old railroad bridge spanning the Piscataquis River, which powered the mills that once thrived here, you’ll find food and services on the commercial outskirts of town where the trail crosses ME 6. You’ll encounter more interesting fare as you proceed across the north side of town. 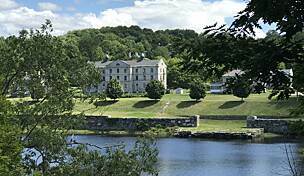 If you’re lucky, you’ll arrive during the annual Maine Whoopie Pie Festival in June. The town goes all out to celebrate this sandwich-sized cookie, a nice reward for a day of exercise. 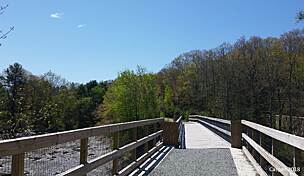 To reach the southern trailhead in Newport from I-95, take Exit 157 toward Newport/Dexter on SR 11/ME 100. Go 0.5 mile northeast on SR 11/SR 100, and stay straight through the US 2 intersection to stay on SR 7/SR 11/Moosehead Trail. Go 0.8 mile, and turn right into the small parking lot adjacent to the trailhead, or go another 0.1 mile, and look for parking on your left. 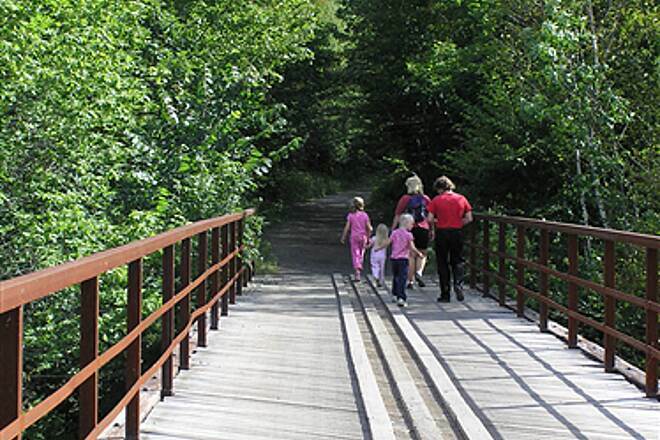 The trail’s endpoint is about 1.2 miles south along the trail in Newport. 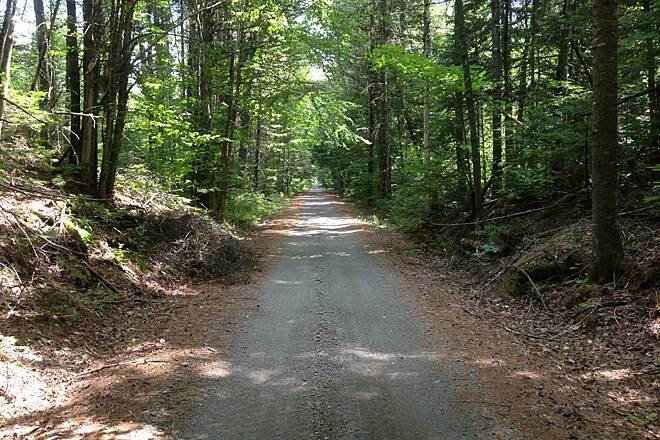 To reach the northern trailhead in Dover-Foxcroft from I-95, take Exit 185 onto SR 15 N/Broadway. 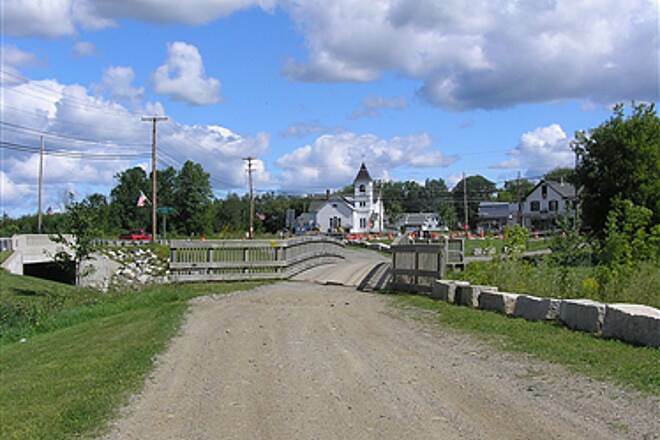 Go 35.2 miles northwest on SR 15 to Dover-Foxcroft, and turn left onto SR 6/SR 15/SR 16/W. Main St. Go 1.2 miles to the trail crossing, where trail parking can be found at the Irving service station on the right. The trail continues north of Main St. for 2 miles. We took hybrids, starting from north trailhead, and were able to go a few miles, but this trail is basically for ATVs--at least 15 passed us in an hour or so. 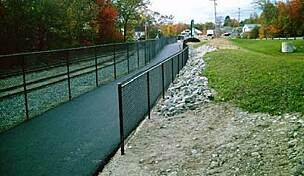 Very nice people, but trail surface has become quite rutted from the vehicles. In places, stone dust had drifted into patches several inches deep, making it hard to steer hybrids. 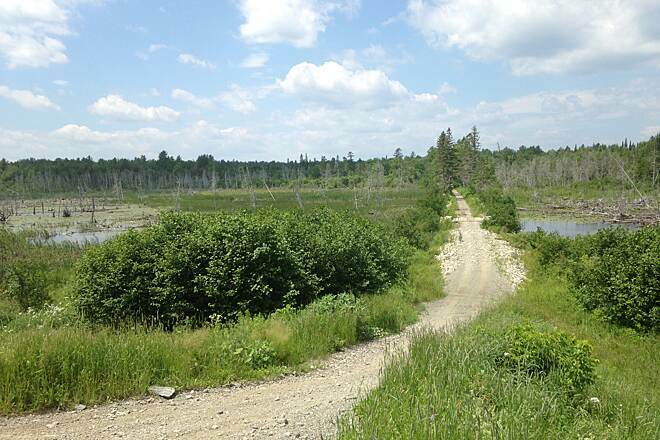 What we saw of trail was pleasant, mostly woods with a few bogs. Crossing the Pisquataquis was beautiful. We also drove south and walked on the Newport end, where the surface seemed less rutted. 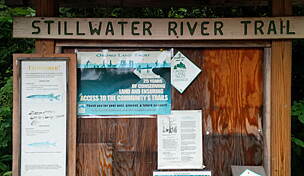 "There IS parking now for folks using the trails. Stay on Route 7 north headed out of town and just after you cross the old railroad tracks (before the Ford dealership), you'll see a Park & Ride lot."